Just getting ready to send your wedding invitations? Find out everything you need to know to get them addressed, sealed and delivered. Several months before your big day, as you prepare to send your invites, these wedding invitation tips will make your life easier. Once your invites are done, the first thing you’ll need to do is choose the right envelope. The standard rectangular shape or square envelopes? Keep in mind, when choosing a larger envelope or a square envelope will require additional postage, so make sure you make the trip to the post office to get the exact pricing. Now onto deciding what color to choose for your envelopes. To help narrow down the rainbow of colors, choose a complementary color to your invites or incorporate your wedding colors. You can brighten it up with a playful, legible font. Be sure to avoid dark color fonts on dark envelopes and light color fonts on lighter envelopes. Whatever you decide to go with, make sure it’s easy to read. Now comes the mother of all the options. Choose from several finishes and decide on the envelope that matches your wedding colors. Then pick a matching lining for your other color. Lining envelopes is an incredibly easy thing to do and is an unexpected touch for your invitation. Choose an envelope liner made with a solid color or a decorative or pattern paper, from a collection of colors and finishes ranging from a classic to modern look. It’s all about mixing and matching the different shades that will add to your presentation. With all the patterns, you definitely won’t run out of options. 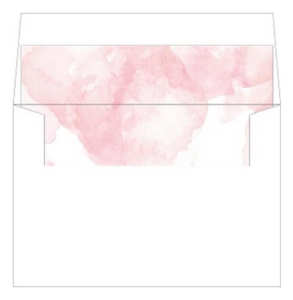 Pink Modern envelope liner by Wedding Paperie. 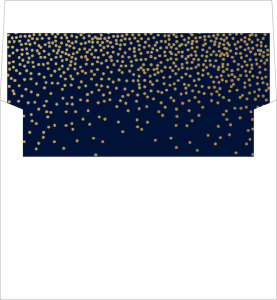 Midnight stars envelope liner by Wedding Paperie. Double check your addresses. It doesn’t hurt to take a closer look for the spelling of the streets and city names, include any apartment numbers, and correct zip codes. Your wedding day will be one of the most important days of your life. Your invite envelopes help to set the tone for your big day. Hand calligraphy gives an instant luxe and elegant look. It’s pretty to look at and admire. 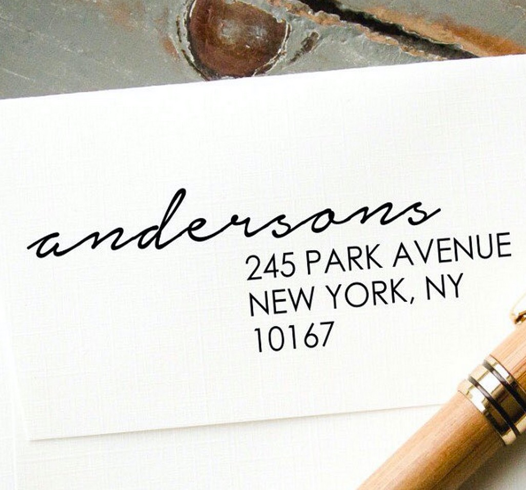 Find the right calligrapher whom you’ll fall in love with their work and will beautify all your envelopes. 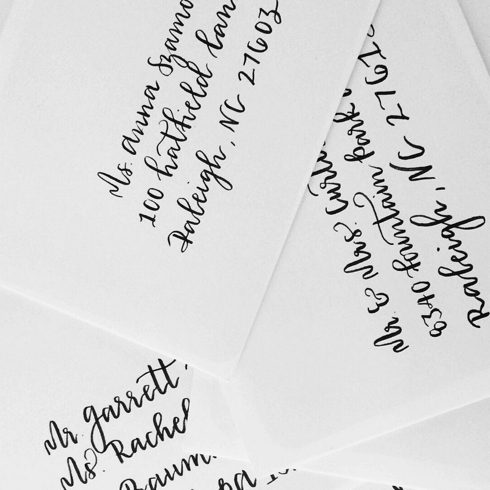 After you pick your pro calligrapher, its time to choose your envelopes. You’ll need to send them to your calligrapher who will then help you decide what colors will go well with the envelopes. Also, a good tip is to include some of your B-list invites, so you’ll have them on hand to send out if needed. Not only can your envelopes be customized with your color, but also, the design, font style and calligraphy preference to match your wedding theme. At the end of the day, who doesn’t love beautiful hand calligraphy? Hand calligraphy envelopes by onefinemorninglettering.com. The ‘Return to Sender’ stamp is not a good look. To avoid this, make sure you bring one sealed invitation to the post office to get the right postage. Plus, while you’re there, you can choose and buy the pretty wedding stamps and of course, ensure the wedding invites will not be returned to you. Before sending your invites, don’t forget to put a return address. In case the invites get lost, they will get sent back to you. The return address usually goes on the back flap of the envelope. Don’t forget that the RSVP envelope should also have the same address. Although, you may save money on writing your own return address, imagine spending hours writing more than a hundred envelopes. I highly suggest investing in a stamp, not your average old fashioned rubber stamp, but a self-inking stamp. Self-inking stamps produce sharp and even imprints every time and you can get through hundreds of envelopes in a fraction of time. It does a better job than a regular stamp as it doesn’t smudge and the oil based ink is fast drying. The best part is that the self inking stamps will not require ink each and every time you stamp and its a huge time saver. This will help you complete all your wedding related correspondence. Custom stamped envelopes from InkMeThis. There are many ways to make a lasting impression with a seal on the envelope, whether it’s a sticker, stamp, embosser, or wax seal. I absolutely love the way wax seals look and feel as a final finishing touch. Make an original, classic and lasting impression with a custom wax seal stamp. Unlike a sticker, stamp or embosser, each wax seal is unique. There are endless designs and symbols you can choose from or customize initials, names, and wedding dates that best suit your styles. 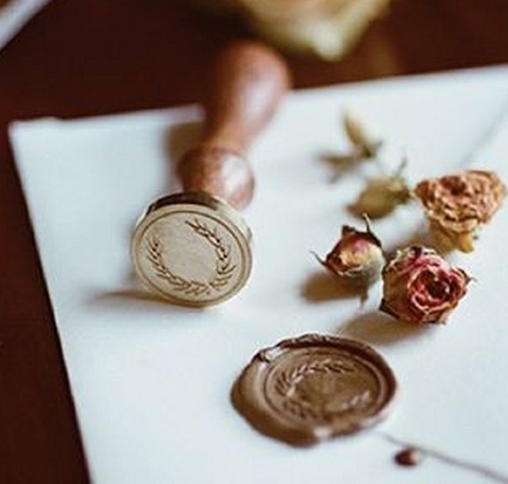 With wax seals, choose the right colors to match your wedding. Think beyond the use of wax seals on envelopes and add a lasting impression to your party favors. The distinctive and personalized look of wax seals will definitely bring an unexpected, happy surprise from your guests. Before you send these invites out, be sure everything is properly sealed. Make sure the gum seal is secure all the way around before adding a wax seal. Once you have all your pieces, the final step is to assemble. Host a wine and cheese night, gather all your bridesmaids and friends and start to put all the pieces together. Before you get started, make sure you make samples of a fully assembled envelope so everyone is on the same page. The quickest way to do this is to have an assembly line method so they all come out the same way. Now that you have all the essentials, you’ll be ready to send your invites. To ensure your invites arrive in the best shape possible, request invitations to be hand cancelled at the post office. This means, instead of having a machine pound through the invites, a human will stamp each envelope by hand. Your local post office branch will be familiar with hand cancelling for formal invitations. Good luck! And when you’re done with your invites, I’d love to see them. Please share them with me on Instagram at @nancenyc.